پهلوانزاده, حسن, زارع نژاد اشکذری, حمیدرضا. (1391). فلوراید زدایی از آب آشامیدنی با ستون جذب بستر ثابت با استفاده از جاذب ارزان قیمت بوکسیت. نشریه شیمی و مهندسی شیمی ایران, 32(1), 17-24. حسن پهلوانزاده; حمیدرضا زارع نژاد اشکذری. "فلوراید زدایی از آب آشامیدنی با ستون جذب بستر ثابت با استفاده از جاذب ارزان قیمت بوکسیت". نشریه شیمی و مهندسی شیمی ایران, 32, 1, 1391, 17-24. پهلوانزاده, حسن, زارع نژاد اشکذری, حمیدرضا. (1391). 'فلوراید زدایی از آب آشامیدنی با ستون جذب بستر ثابت با استفاده از جاذب ارزان قیمت بوکسیت', نشریه شیمی و مهندسی شیمی ایران, 32(1), pp. 17-24. پهلوانزاده, حسن, زارع نژاد اشکذری, حمیدرضا. فلوراید زدایی از آب آشامیدنی با ستون جذب بستر ثابت با استفاده از جاذب ارزان قیمت بوکسیت. 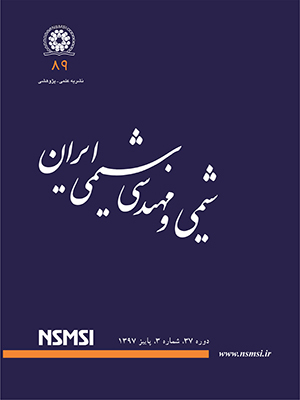 نشریه شیمی و مهندسی شیمی ایران, 1391; 32(1): 17-24.
 WHO, ”Guidelines for Drinking-Water Quality”, Volume 3. Surveillance and Control of Community Supplies. 2nd Edition. World Health Organization, Geneva (1997). WHO, “Guidelines for Drinking-Water Quality”. Volume 3. Addendum. Surveillance and Control of Community Supplies. 2nd Edition. World Health Organization, Geneva (1985). Handa B.K., Geochemistry and Genesis of Fluoride-Containing Groundwaters in India, Groundwater, 13, p. 275 (1975). Fomon S.J., Ekstrand J., Ziegler E.E., Fluoride Intake and Prevalence of Dental Fluorosis: Trends in Fluoride Intake with Special Attention to Infants, Journal of Public Health Dentistry, 60, p. 131 (2000). Kumaran P., Bhargava G.N., Bhakuni T.S., Fluorides in Groundwater and Endemic Fluorosis in Raajasthan, Indian Journal of Environmental Health, 13, p. 316 (1975). Fawell J., Bailey K., Chilton J., Dahi E., Fewtrell L., Magara Y., Fluoride in Drinking Water World Health Organization, Indian Journal of Environmental Health, p. 54 (2006). Jamode A.V., Sapkal V.S., Jamode V.S., Defluoridation of Water Using Inexpensive Adsorbents, J. Indian Inst. Sci., 84, p. 163 (2004). Piñón-Miramontes M., Bautista-Margulis R.G., Pérez-Hernándeza Chihuahua A., "Removal Of Arsenic and Fluoride From Drinking Water with Cake Alum and a Polymeric Anionic Flocculent", Fluoride, 36(2), p. 122 (2003). Mohanty A., "Development of A Hybrid Material for the Removal of Fluoride From Water", A Dissertation Submitted in Partial Fulfillment for the Degree of Master of Science in Chemistry , The Academic Autonomy National Institute Of Technology, Rourkela (2003). Jorfi S., Rezaei Kalantary R., Mohseni Bandpi A., Jaafarzadeh N., Esrafili A. 2, Alaei L., Fluoride Removal fromWater by Adsorption Using Bagasse, Modified Bagasse and Chitosan, Iran. J. Health & Environ., 4 (1) (2011). Yong K., Hweimei C., The Adsorption of Fluoride Ion from Aqueous Solution by Activated Alumina, Water , Air , Soil Pollution, 49, p. 51 (2001). Sajidu S.M.I., Masamba W.R.L., Thole B.3, Mwatseteza J.F., Groundwater Fluoride Levels in Villages of Southern Malawi and Removal Studies Using Bauxite, International Journal of Physical Sciences, 3 (1), p. 001 (2001). Cao J., Bai X., Zhao Y., Zhou D., Fang S., Jia M., Wu J., Brick Tea Consumption as the Cause of Dental Fluorosis Among Children from Mongol, Kazak and Yugu populations in China. Food and Chemical Toxicology, 35(8), p. 827 (1971). Fan X., Parker D.J., Smith M.D., Adsorption Kinetics of Fluoride on Low Cost Materials, Water Research, 37, p. 4929 (2003). Subhashini Ghorai, Pant K.K., Equilibrium, Kinetics and Breakthrough Studies for Adsorption of Fluoride on Activated Alumina. Journal of Environ, Science and Engg, 130(12), p. 231 (2004). Mitali Sarkar, Aparna Banerjee, Partha Pratim Pramanick, Asit Ranjan Sarkar, Design and Operation of Fixed Bed Laterite Column for the Removal of Fluoride from Water, Chemical Engineering Journal, 131, p. 329 (2007). Subhashini Ghorai, Pant K.K., Investigations on the Column Performance of Fluoride Adsorption by Activated Alumina in a Fixed-Bed, Chemical Engineering Journal, 98, p. 165 (2004).